Here it goes…when I have an extra couple minutes I like to go around the house and empty the trash containers. Seriously – for some reason this is rewarding – don’t ask me why. I blame this on a fun little tip I got from Real Simple. I have collected a number of empty Kleenex boxes, stuff them with plastic grocery bags and I simply keep them under the sinks in the bathrooms. During those extra couple minutes - I go to the nearest bathroom, grab a bag and start emptying! I know there is a million other fun things you can do – but cut loose a little and try it out – secretly I think you might like it too! Can’t get any cleaner than that right?! Head on over to Harperville Home and enter to win! so happy you came to visit again — isn’t it funny how the blogworld can connect people? 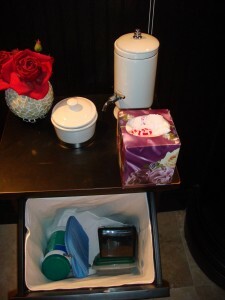 like your kleenex box idea…i’m going to implement that one and want to know MY dirty little secret? i love to vacuum, i swear i could happily vacuum every single day with no complaints, but now dusting, that’s a whole new can of worms…. Girl, we are related! I love the night before trash pick up. I go to all the garbage cans and empty them. I just put extra bags in the bottom of the cans but that is a great idea about the Kleenex box. 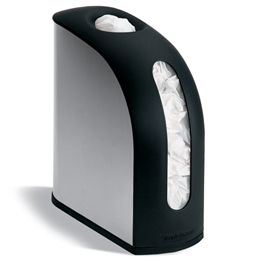 Now that is a great idea…the Kleenex box thing. You keep reading that magazine and then summarize the good stuff for me k? The tissue box idea is great. I was just tossing an empty one the other day wondering “I wonder what I could use this for?” Then shook myself & tossed it. Now I think I will let my 3yo play in the tissue box just so I can have another empty one to put the baggies in! Thanks. i TOO love to empty the trash AND vacuum! something about clean floors and cans make everything feel so much better! the tissue box idea was awesome and i LOVE that container store product. if you saw my bag pile in the bottom of my pantry, you’d understand why that sleek beauty is calling my name!